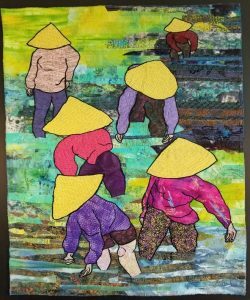 Join artist Jean Herman in the Sturgeon Room Gallery at Central Presbyterian Church to view her work currently on display, Adventures in our World, featuring mixed media and fiber art works. And at 6:30, meet outside to be part of a mobile sound sculpture, Phil Kline’s Unsilent Night. Jean’s work reflects her view of the world as she sees it, sometimes quirky, sometimes reflective and always intriguing. Up close you can observe the incredible detail of her collage and stitch technique; from a distance her work reads like an oil painting. She likes to think she is telling a story and often delves into our eternal human quest for answers into God’s plan and our own search for meaning. To learn more about Jean and to see her work go to her website, www.jeanherman.com.